I was messing around one day with salad dressing variations and mixed some lemon juice with some Dijon mustard. It was good, but not quite right. It needed something sweet in it. The classic honey mustard combo was what I went for. After the initial salad dressing test, I tried it on a few other things. It makes a good coleslaw. 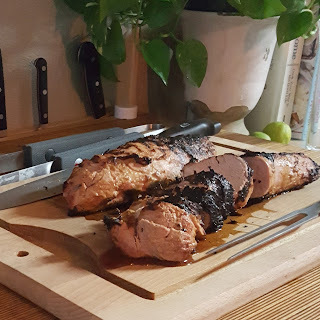 But where I hit gold, was as a pork marinade. The spice of the mustard, the sweet of the honey, and the acid of the lemon compliment the pork perfectly. Perforate the pork with a fork to allow the marinade to get inside the meat. Move the pork to a large storage bag. In a large bowl, mix together the mustard, honey, and lemon juice. 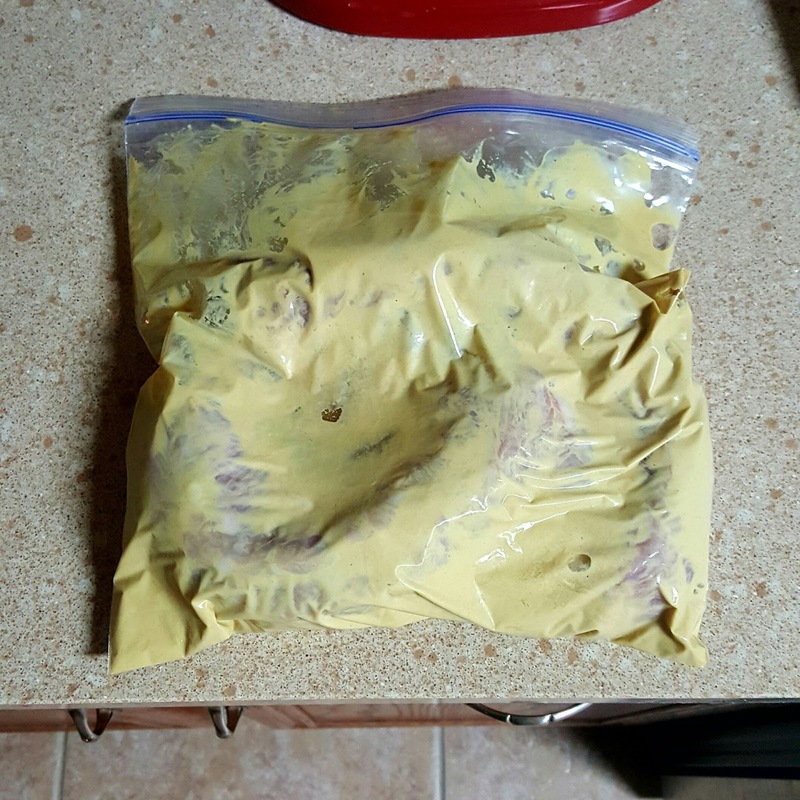 I like to use a coarse grain mustard to give it some extra spice, but it depends on who I am cooking for. 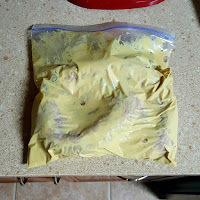 A milder, smoother mustard will work fine. Just don't use yellow mustard here. Don't worry about straining out the seeds or pulp from the lemon. It helps with the flavor. Pour the marinade in to the bag with the pork. With the bag sealed, work the pork and marinade around to get the pork completely covered. Let the pork sit in the fridge for at least 12 hours, preferably overnight. not to actually cook the meat. Remove the pork from the bag and place on a plate to let the extra marinade drip off. The mustard has a habit of burning and let it drip off a little will help prevent any unwanted burning on the grill. I like to use charcoal for this dish instead of gas, so that I can get a good smoky flavor in the pork. The smoke and mustard flavors were meant to be together. Get the grill to about 450-500 degrees. If you want to throw some oak or hickory in there to help get some smoke going. 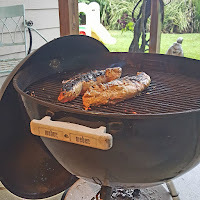 I use an oak lump charcoal that works really well. Grill about 10 - 15 minutes per side and then over indirect heat another 5 - 10 minutes. I've served this with a few different things. Salad. Mixed veggies. Roasted potatoes. Usually I'll have rolls in the freezer I can throw in the oven. 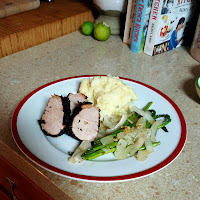 This time, I served the pork with some cheesy mashed potatoes and asparagus sautéed with onions and garlic.